What if all the free daycare forms you needed to start a home daycare were organized in one place? Wouldn't it be great if they were available for immediate printing? At this site they are. The following is my collection of free daycare forms. Feel free to print and use for your own personal use. I realize I should not have to say this, but... I expect everyone to play nice. 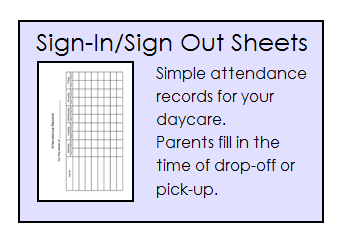 The free printable daycare forms offered here are my own forms used in my daycare. As such, they are protected by copyright and are not meant to become part of another collection or offered for sale in any way. For all daycare providers, please use the free daycare forms as you like for your business. 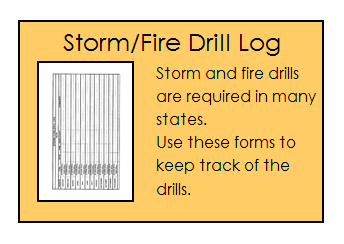 Print them out and use immediately, or use them as samples to create your own. Each form comes with a brief explanation of how to use it, and why you'll need it. 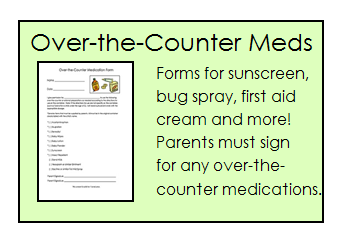 These are the "must have" forms that all providers need to have parents fill out. These forms must be in your records. Includes a sample contract and policy handbook, emergency, immunization, and transportation forms. 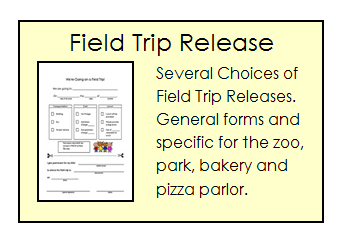 I've also included an All About Your Child form and a sample Daily Schedule. Neither are required, but both help to promote you as a child care professional. 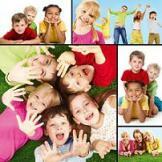 There are many home daycare forms necessary to operate a home based daycare. 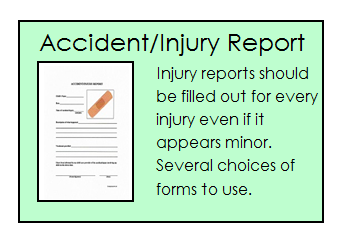 I refer to the "must have" forms as the Folder Forms. Every prospective parent who comes for an interview is given a folder. Keeping the necessary home daycare forms in a folder makes it easier for you to go over the forms with parents during the interview process. 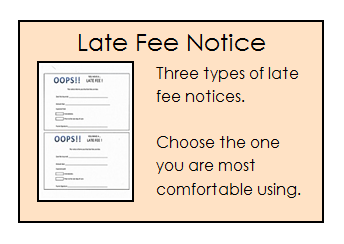 The folder also makes it easier for the parents to keep all the papers together, assuring you that all the paperwork will be returned in a timely manner. This section includes all the forms you'll use in the day to day operation of your home based daycare. Some you will use daily, others only on occasion. Click on the type of form you need... you'll be taken to the page for that form. Each form has several choices. 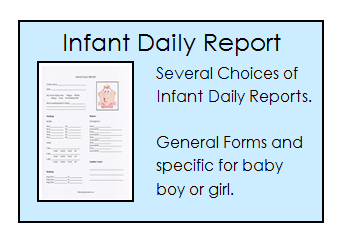 Simply choose the form best suited for your daycare. 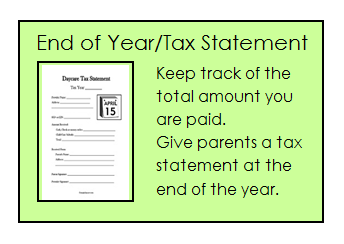 Last, but not least, you'll need handy parent notes and awards for the kids. 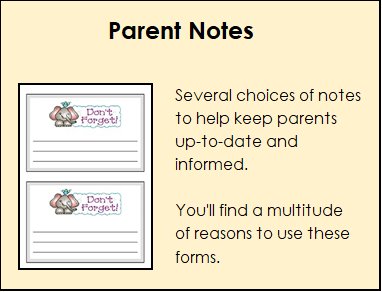 Parent notes are an easy way to keep parents informed. 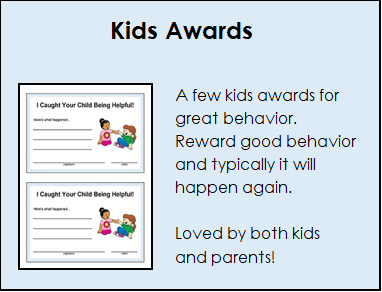 The Kids Awards are presented for good behavior you'd like to see repeated. There are several to choose from. 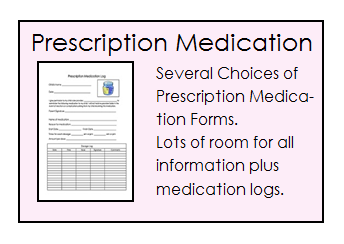 Check out each category and print out what you need for immediate use. Having the forms ready made will make it easier to start your own home based daycare.